Man this one right here is going to be extra simple a cave woman could do it. Well yesterday I was speaking to a friend and she was real upset. The reason was a person that she supports in the business flat out ignored her art and actually deleted her song off his page, when she asked him for feedback. She was telling me she wanted to tell him about his actions, but felt it was unprofessional. I gave her the same advice I give myself and I am going to give it to you all now. There are many people our here that have the same dreams and aspirtaions as you. I know for a fact there are over thousands, if not millions of blogsites out there. The thing we must understand is that there is also an audience for everybody. We may all be in the same industry, but someone may like what I do better than you. That is not saying yours is an worse or better than mine, it simply means that people will be pulled into one more than the other. 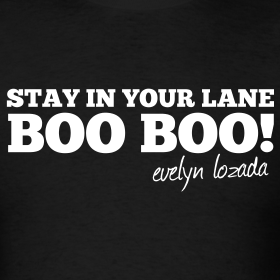 I say this when you realize certain people do not support you, flat out leave them alone. I used to concern myself with naysayers and that is a waste. WHY? Well the time I waste on someone who does not appreciate me, I could spend on someone who does. The negativity that I feed into is wasting my energy, instead I let it fuel my desire to continue. 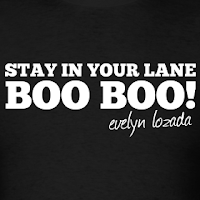 As the title of today's post states: "Stay in your lane"...do not concern yourself with other drivers on the road to success, just look ahead, and keep pushing that gas pedal. Competition is good, because it makes us become creative, it makes us exceed our own expectations, and it makes us great. The thing about it is, there will always be competition in good business. Do not waste time with things that do not inspire you to become a better "goal-reacher"<====that is my new term and I am sticking with it. As always think about it, if it makes sense to you than put it to practice.